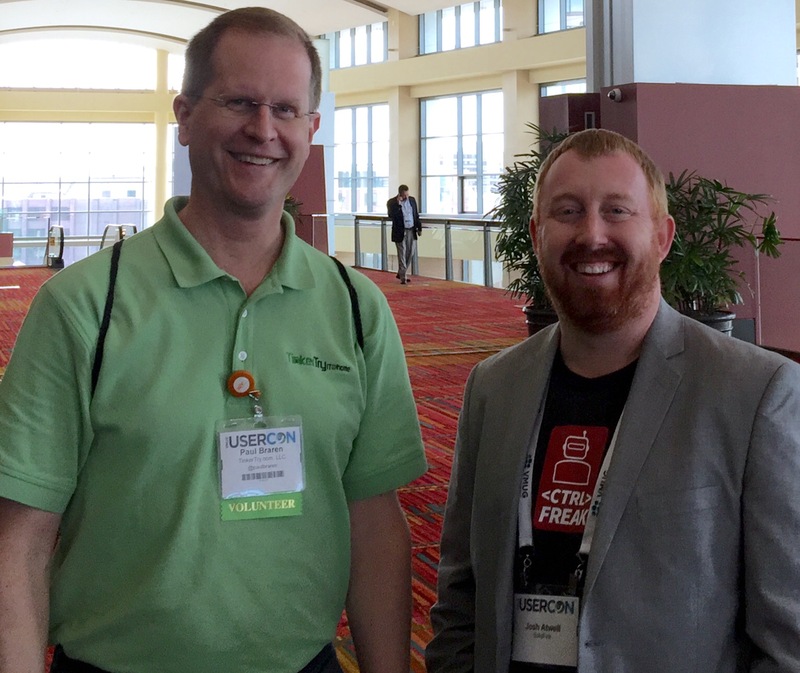 It's an honor to have been invited to present at the Connecticut VMUG UserCon on May 21, 2015. What's extra nifty here is that participating at the demo zone at this UserCon also turned into an offer to record a 14 minute video that will soon be appearing at vmug.com/webcasts, scrolling on down to the Customer Spotlight Series. Sounds like fun to me! If you happen to be coming to the event, please stop by and say hi. 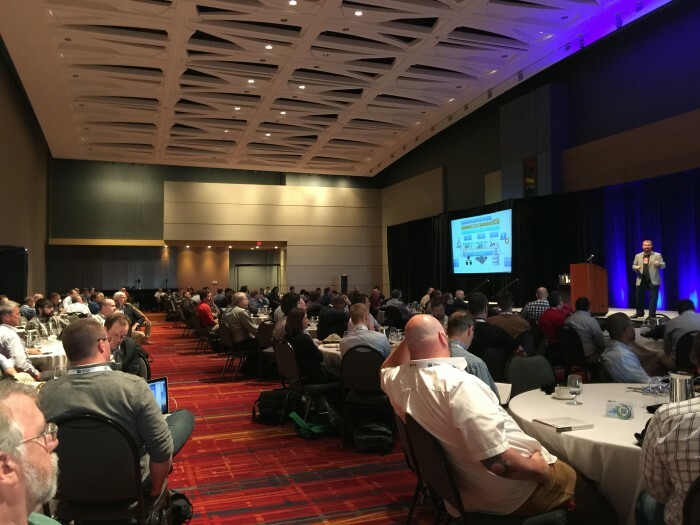 For me personally, the most valuable part of attending any user group is the networking, those invaluable contacts with new people who are generally happy to share fresh perspectives and ideas. If you attend this UserCon or any UserCon, please feel free to share your experiences with everybody by dropping a comment below this article. Typical home WiFi routers might give you all you need to get your vSphere 6.0 lab going, with no separate DNS server required! Avoid ugly IP addresses, instead, use nice friendly names like esxi and vcenter. Bonus tips: use Chrome to make your vSphere Web Client look and act more like an application, and avoid the pesky need to type administrator@vsphere.local to login to your VCSA appliance. Live demonstration using a secure connection to my actual home lab. I've finished recording the video, it'll be available soon. You can read all about Customer Spotlight videos at vmug.com/customerspotlight, where you'll also see that you can email customerstories@vmug.com if you're interested in recording one of these. 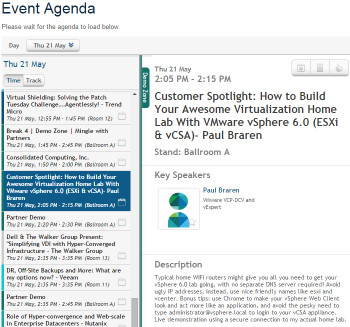 VMware VMUG has now published the video for VMUG members to log in and view at vmug.com/customerspotlight, and apparently I'm the second one published there. Quite an honor! 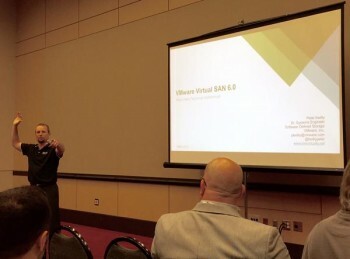 Matthew Kozloski, Data Center Practice Manager at Kelser Corporation, was the always-affable emcee yesterday, who also runs this VMUG. He also happens to be brilliant, just ask anybody who works with him. 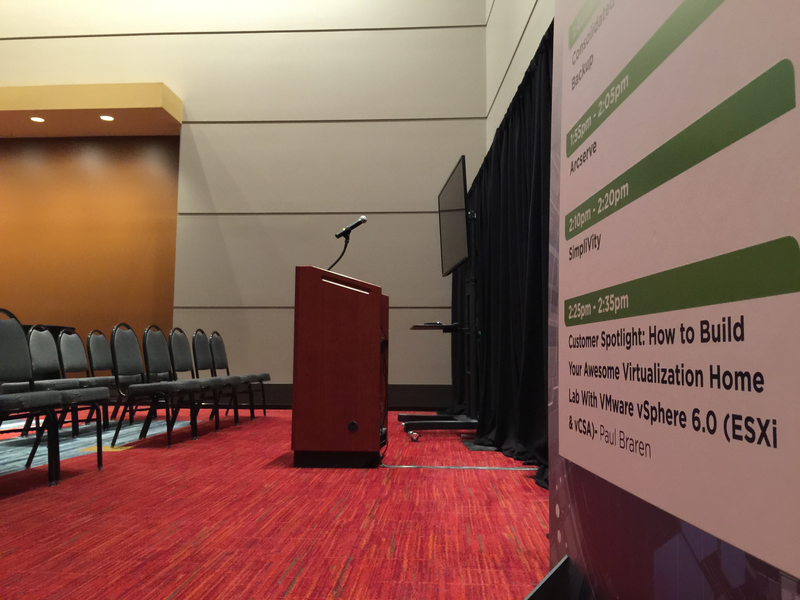 Coupled with the very professional VMUG team, and clearly we had another great VMUG event this year. Always fun to catch up and greet familiar faces, and hear who is ready for vSphere 6.0 already, and who isn't quite there yet. Also great to see so many new companies in the exhibitor area. Chatted with several VMware engineers to geek-out over things like the VCSA 6.0 install procedure, and finally got to meet with SolideFire's Josh Atwell, @Josh_Atwell, of vTesseract fame. 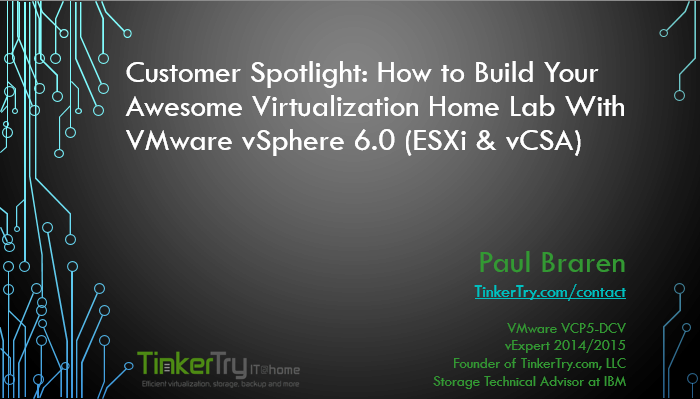 Check out his article and my article about his recent publication of Mastering VMware vSphere 6. As for my own presentation? I have no pictures from when it was underway, but I was delighted to have at least 35 folks in the corner of the exhibitor area, where another emcee did a somewhat spooky room-wide PA system announcement, politely asking to come on over. Many folks standing behind the rows of seats likely couldn't see my live demo very well, but they seemed to enjoy what they heard, and glad I had the large-font PowerPoint (above). Perhaps my stack of TinkerTry.com business cards disappearing from the podium right after my talk was a good sign. How many of you have tried vSphere 6.0 at all yet, at work, or at home? Only about 7 hands went up. So that's a lot of "just looking" folks, and the perfect audience! 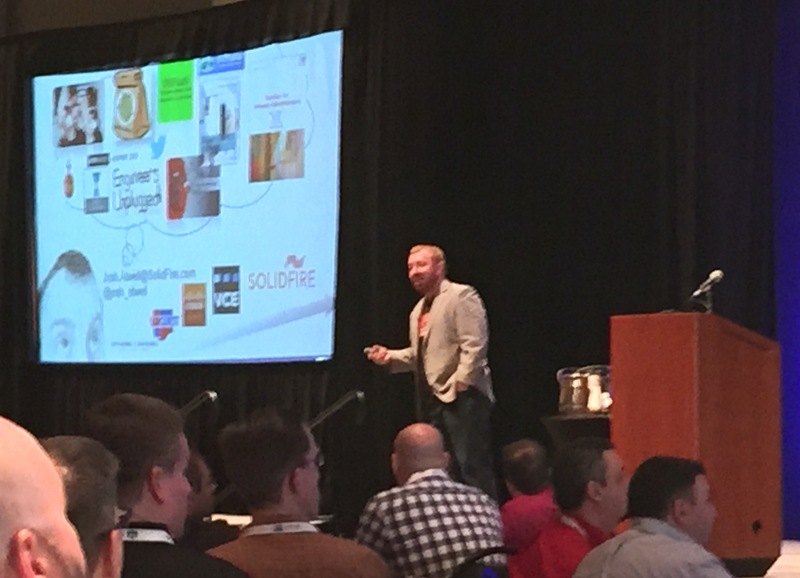 Tintri, John Shedlosky (Senior Systems Engineer) Virtual Volumes for Everyone - Right Now! then had a little fun with Peter about an imagined Supermicro vSAN on Google+ and Twitter here.